burn PowerPoint to DVD with music. As a top-ranked multimedia tool, Leawo PowerPoint to DVD Pro provides a one-stop solution for users who intend to convert PPT to video and burn that to DVD for better sharing or saving space. Speaking of the output file effects, this program is able to perfectly retain all elements in a PPT after burning that to DVD, including animations, transitions, background music, voice narrations and movie clips, etc. Besides, it can well synchronize audio and video in the output video/DVD/Blu-ray file. It allows users to add music as background across some slide or the whole slideshow before burning that to DVD. In the following, a detailed procedure on how to burn PowerPoint to DVD with music using Leawo PowerPoint to DVD Pro will be introduced. Now let’s take a look at how it works to save PowerPoint to DVD disc with the background music added. Step 1: Download and install Leawo PowerPoint to DVD Pro. Click the below button to download and install the program to your PC. It takes only a few minutes. After installation, launch the program. Step 2: Import the source PPT to the program. .
As shown below, hit the “Import” tab on the toolbar, where you can import your source files to the program. To save time, import them in batches. Step 3: Set DVD options and the output folder. Under the “Options” tab, you can set the DVD options such as norm, mode, aspect ratio for the output file and specify the folder to save the output file. On the top right there is an advanced setting icon, click this icon to enter the “Advanced Settings” menu, where you can further set the slide size or conversion options. Step 4: Set a menu for the DVD. Click the “Menu” tab and select a menu for the DVD. 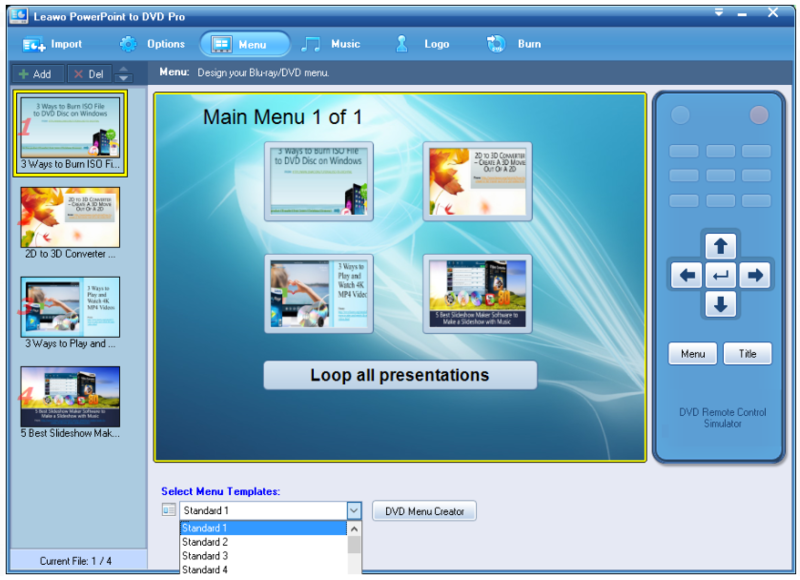 Note that many menus are developed for free within the program. Step 5: Add music to the file. This step is critical if you want to add music to the DVD. Click the “Music” tab to choose music and embed it to certain slide or the whole slideshow. Both manual mode and auto mode are supported. Step 6: Import a logo to the DVD. This step is optional. If a logo is needed, click the “Logo” tab to get it in. Step 7: Start to burn the PPT to DVD. Once all settings are done, click the Start button to burn the PPT to DVD, which will be quick. The green bar shows the conversion process. When the whole file is burned to DVD, you can have your DVD ready for playing anytime and anywhere you like. Apart from the professional Leawo PowerPoint to DVD Pro, there are also some freeware for you to give it a shot. If you have no idea about how to make a photo slideshow with music on DVD and don’t know any program, Windows DVD Maker is enough for beginners. This is free for all users on Windows but the fact is it does not provide as many features and powerful settings as other professional programs like Leawo PowerPoint to DVD Pro. Users may choose this program to make simple DVD out from PPTs. After launching the Windows DVD Maker, click Add items to import the source files and then click Next to proceed. This is suitable for novice but not for those who are interested in professional DVD making. 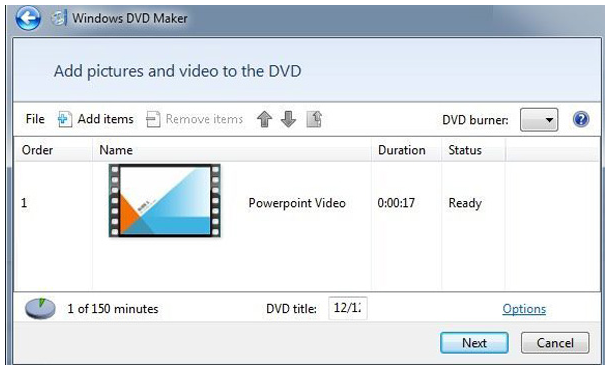 In short, either Leawo PowerPoint to DVD Pro or Windows DVD Maker is good for you to burn PowerPoint to DVD. To give you more options to customize your DVD, such as adding background music to the PPT, I suggest you go for professional DVD maker like Leawo PowerPoint to DVD Pro as this is more powerful and efficient for you to burn PowerPoint to DVD. 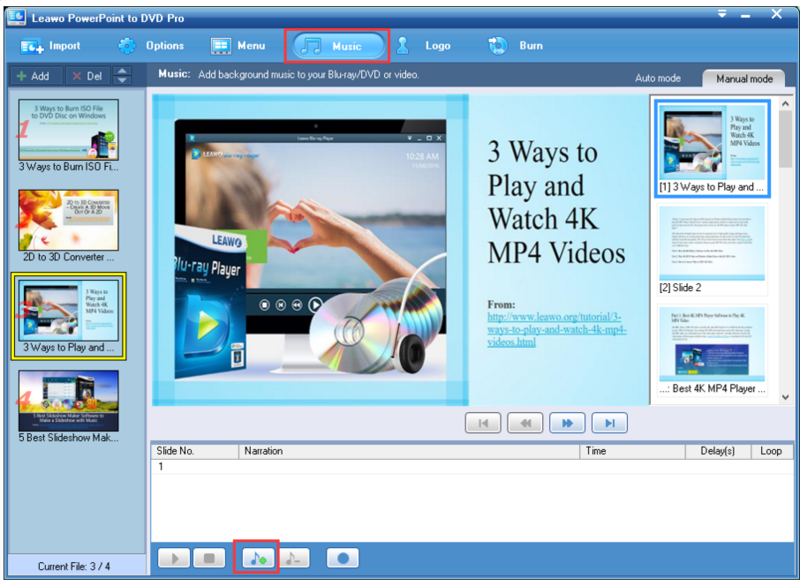 In other words, with Leawo PowerPoint to DVD Pro, you can freely burn PowerPoint to DVD/Blu-ray movie for enjoying on TV or projector with DVD/Blu-ray player.